I hope you find the answer to your question here. If not you can email me using the form below. Powertex is a water-based fabric hardening medium. It’s used for sculpture, painting, outdoor artworks and more. I’ve written a blog about Powertex that you can read here for more information on this versatile medium. 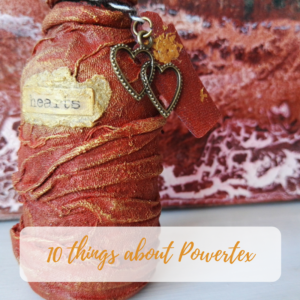 Where can I buy Powertex? Here in the UK the main stockist is Powertex UK although some Powertex tutors and craft shops also hold stock. For outside of the UK, this list may be useful to you. Yes, I’m in Brighton, UK and my tutoring is based in the areas of Brighton and Hove and Shoreham-by-Sea. During the summer months I’m usually on the local Open House and gallery circuit but I run a program of events from September. You can keep up with these on my Kore Sage Art Facebook page. If you would like a private tutoring session or would like to make a particular project please email me at the address below and let me know what you have in mind! Powertex has tutors all over the UK so if you are looking for a tutor outside of my area you can get in touch with Powertex UK. My original art is available to buy in my Etsy online store. Please note I am currently only shipping to the UK. Any events exhibiting my art are listed on my Kore Sage Art Facebook page. Art shown via the Adur Art Collective is also listed for sale on their website here. Do you teach your Powertex or mixed media classes online? I have several video tutorials in the pipeline and some downloadable project sheets for Powertex projects. I plan to offer some mixed media classes in the future so watch this space. I have a video demonstration for creating stone effect with Powertex Stone Art, it’s on YouTube. If you have any other questions and would like to get in touch please use the form below. I aim to reply to messages with 24 hours but it may be longer during busy periods. I look forward to hearing from you!